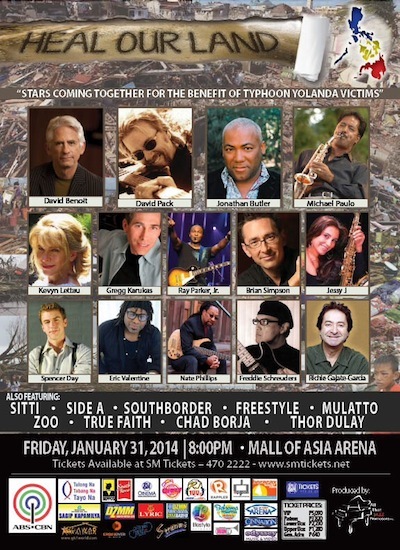 World renowned artists have come together in solidarity with the victims of Typhoon Yolanda to hold a benefit concert titled “Heal Our Land,” at the Mall of Asia Arena on January 31, 2014. The benefit concert is unique in that it features an all-star lineup, led by pianist David Benoit and singers David Pack and Kevyn Lettau, and including keyboardist Brian Simpson, American saxophonist and singer Jessy J, percussionist Richie “Gajate” Garcia, and guitarist-singers Ray Parker Jr. and Jonathan Butler, whose song has inspired this concert’s title. Also joining “Heal Our Land“ are Filipino-American saxophonist Michael Paulo, pianist-singer-songwriter Spencer Day, pianist Gregg Karukas—and Freddie Schreuders, Eric Valentine, and Nate Phillips of the LA All-Star Band. David Pack, the former frontman of the celebrated group Ambrosia, was originally scheduled to perform in Manila on the said date. Gregg Karukas, Michael Paulo, and Spencer Day were also scheduled to hold their respective concerts early in 2014. David Benoit conveyed to the producers of the David Pack concert that he wanted to do something to help the victims of the supertyphoon. Pack was consulted and said he was happy to take part, and after further discussions among Benoit, Pack, and the organizers of his concert, his show became an all-star benefit enterprise. Artists waived their fees for this concert, whose proceeds will go to the relief efforts of ABS-CBN’s Sagip Kapamilya and Gawad Kalinga projects. This concert presents a great roster of stars, who also include Billy Crawford, Sitti, Side A, South Border, Free Style, Mulatto, Zoo, True Faith, Chad Borja, and recent “Voice of the Philippines” contender Thor Dulay. The concert will be directed by Bert de Leon. “Heal Our Land” is produced by All That Jazz Promotions Inc, with the support of ABS-CBN and other partners.